Capcom and Namco believe that fighting games will see a resurgence off the back of their collaborations. The fighting genre got a shot in the arm with the release of games like Super Street Fighter IV and Tekken 6, and Capcom and Namco hope that their upcoming collaborations, Street Fighter X Tekken and Tekken X Street Fighter, will push the genre forward to new and better things. Stuart Turner, Capcom's head of marketing for the UK and Europe, said that just as recently as a few years ago, the fighting genre had looked like a relic of generations past, and now that they were back on people's radar, he hoped that the Capcom/Namco crossovers would "produce a true celebration of the genre." Lee Kirton, Namco's marketing and PR manager, called the announcement of the crossovers "historic," and said that the reaction from fans had been astounding: "The two biggest fighting franchises have finally come together, which can only raise the appeal of both these legends," he said. "After the reaction from fans at Comic-Con, I think that this is one of the biggest gaming announcements ever." Obviously, it's the job of marketing people to say that their products will be amazing, but the excellent Street Fighter IV games show that the skills are there to back the claims up. 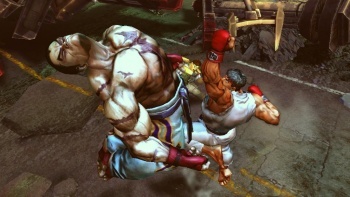 Whether Street Fighter X Tekken will usher in a new golden age for fighting games remains to be seen, but it's hard to believe that the games won't be a heck of a lot of fun.